If you follow me on Twitter, you may have seen me talking about the Apollo's Daughter's anthology, an add-on to the Athena's Daughters Kickstarter. 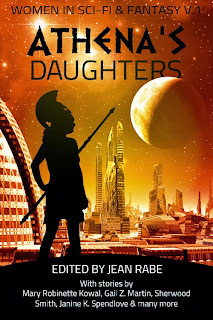 Athena's Daughters: Women in Science Fiction and Fantasy is an anthology featuring short speculative fiction by top female authors, including Mary Robinette Kowal, Janine Spendlove, Sherwood Smith and Gail Z. Martin, among many others. The Kickstarter did so well that the anthologists, Silence in the Library, added a companion volume by male authors about female protagonists: Apollo's Daughters includes stories by Michael Stackpole, Aaron Allston, David Mack, Bryan Young and many more. 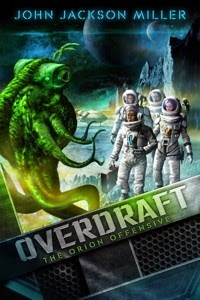 I'd announced my participation a little in the anthology over the holidays, but I can now add that my contribution to Apollo's Daughters will be a Bridget Yang story from the Overdraft universe, as seen in Overdraft: The Orion Offensive and in Human Error. It was that latter Bridget short story in Baen's Armored anthology that kicked off the Overdraft world, so I'm pleased to have another one out there. Like the companion volume, Apollo's Daughters is edited by Jean Rabe and is expected to release later this year. At the $31,000 funding level, it'll have a cover by Joe Corroney, who drew my first comic book, Crimson Dynamo. Small world! There are still a few days left to support the Athena's Daughters Kickstarter; to get the Apollo's Daughters anthology, you simply need to do an "add-on" to the pledge for $5 for the e-book and $20 for the physical book. Folks who have already supported the Kickstarter can add the book to their purchase in the same way, by revising their bid. (That's as near as I understand it, anyway!) Thanks for your support!